The 6th annual 2016 Garden and Design Bloggers Conference was held Atlanta last week. This two- day conference packed in amazing speakers, great sponsors (Including The Davey Tree Expert Company) and leaders in the garden and design world. Stacey and Katie attended, took copious amounts of notes and wanted to share their top 3 takeaways. If you’re not on Instagram stop what you’re doing and make an account. And change your profile link every other day. Don't be afraid to speak your mind, ask questions or accept that you don’t know everything. Create first and Google second. Make whatever you create different and original enough. Just be real. Be yourself. Everyone can relate to someone who’s putting their heart out on the table, trying to be honest and doing the best they can. That’s what I do, and it’s worked so far! Once you have a North Star, you have something to work toward. Whether it’s writing, sketching, blogging or working out, having clarity in your end goal is critical to success. She even color-coordinated her Pinterest profile to look like the rainbow. Connor Dwyer, a design student at SCAD with 78,000 followers on Instagram, gave a talk about branding. He stressed that everything about the content you create should be intentional. Hashtags, titles, captions and even filters play a part in creating your brand and voice online. Additionally, all of the speakers touched on the fact that they look at their analytics daily! This is something that we don’t spend enough time doing. Since then, we have taken a hard look at all of our analytics. We discovered one of our Pinterest boards is way outperforming the others! Justina suggested using Ink361 to track Instagram. It’s simple way to see what posts are working, and which aren’t resonating with your audience. Overall, posting great content is important, but sometimes what that content is may surprise you. Analyze, analyze, analyze! We were there to learn from and meet top bloggers, but we were also there for Davey Tree. 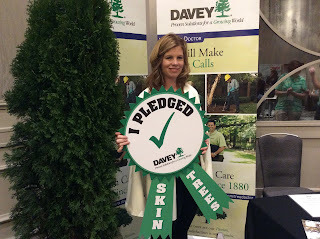 More than 80 bloggers took Davey’s Nature’s Sunscreen pledge to treat tree care like health care. We educated them on why tree care is important and what they can do in their yards to protect their trees. 1. Inspect trees and shrubs from the bottom up. Check for brittle or dead branches, soft or decaying wood, small holes in trunk, or shallow pits in the bark. 2. Apply a slow-release fertilizer to keep trees growing strong. This replaces nutrients and improves resistance to damage from disease, insects and stressful weather. 3. Water trees to keep them well-hydrated throughout the year. A subsurface watering method to quench their roots is ideal for all trees and shrubs, especially those suffering from drought stress. 4. Plant the right tree in the right place to maximize both your trees’ lifespan and your landscape’s economic rewards. 5. Schedule a check-up with a certified arborist to ensure the best care for your trees. An arborist will spot hazards, explain potential concerns and may find something you missed. Overall it was a fantastic conference where we learned from the great, met a lot of new friends and had the opportunity to hang with familiar faces. See you next year! Cultivating is the technique for developing plants. Fancy plants are by and large developed for blooms, foliage, general look, and for their hues. Useful plants are developed for utilization reason like vegetables, organic products, herbs, and leaf vegetables or for restorative use. Planting requires persistence and perception. At this moment you could be pondering what precisely is that basic angle. In the event that you get this right, that is beneficial for you since you recognize what is the center central of natural gardening. On the off chance that you are unverified, we should experience it together. I will give you more natural gardening tips as well. On the off chance that you adore nature and need to accomplish something to ensure the earth, then nothing is superior to Gardening. It is a delightful and satisfying knowledge in itself.